It's a code that is being furnished when the program is purchased and that makes the program fully operational. printed on the invoice (for those buying directly from us). IMPORTANT: Keep the license key in a safe place. In case the license key gets lost, read our page Lost license key. With Banana Accounting 9 the license key can be used on all operating systems. 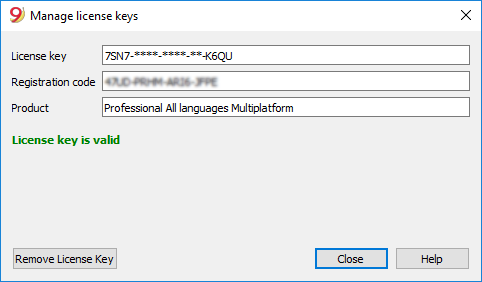 If you install the program without entering the license key, the program runs in Free Version mode. For all other applications you can use the program in complete mode, entering up to 70 rows into the Transactions table. If you have more than 70 rows in the Transaction table you won't be able to save or export the file, and in the print-outs the words "Starter Edition" will appear. When the license key is being entered, Banana Accounting switches from the Free Version mode into the complete Professional mode. Important: The license key is saved only for the current user of the computer. For security reasons the license key is partially hidden. In case the user loses his license key, the registration code can be used to find the license key that he has entered. It is important to copy this registration code and keep it in a safe place. Before modifying an already entered license key, please save your open accounting files and close them; only the program remains open. 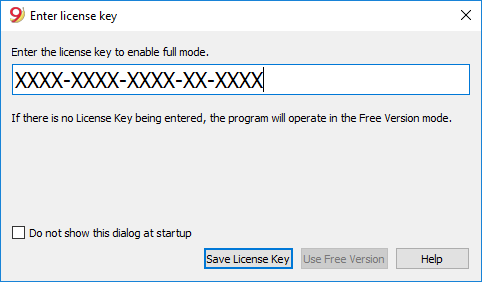 In order to modify a license key, you have to first remove the existing license key and then enter the new (different) license key. Click on the Remove license key button to remove the key. By removing the license key, the program switches back to the Starter Edition mode. At the end of this operation, close the program and restart. If you have registered your product, you can recover your license key through the License key recovery form without fees. You can also ask us - by email - to resend you your own license key (service fee). For us to be able to find it, please send us the registration code displayed in the Manage license keys window (Help menu). You may also send us a screenshot of that same window. Resending you your license key has a cost of 20.- CHF. If the registration code cannot be provided, but only a proof of purchase, the costs will be 30.- CHF. As an alternative to the recovery of the lost license key of the previous version (eg Banana Accounting 5, 6, 7 and 8), we recommend the purchase of Banana Accounting 9, valid for all operating systems at the upgrade price of CHF 89.- (instead of 129.-). For more information please see the Updates page.